Water care and spa maintenance will ensure you experience many years of pleasure from your hot tub. 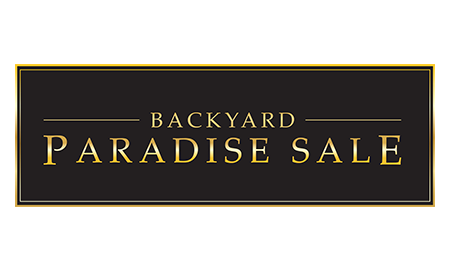 At Coast Spas Lifestyles we carry a wide selection of hot tub and pool products to protect your investment for years to come. Don’t know what you need? Come in today for a FREE water test. Our Coast Spas Lifestyles professional water lab is there to provide you with a free computer water analysis. Visit us today for all your pool and hot tub maintenance needs. Sanitation refers to the control of infectious organisms (bacteria, virus, etc.) and the removal of excess organics (perspiration, urine, body oils). Bromine and Chlorine are the only two sanitizers that are approved by Health Canada for use in hot tubs. Bromine tablets are the most commonly used sanitizer in hot tubs that can be dispensed through a floating dispenser. The dispenser can be adjusted to get the right level of Bromine for your spa. This system is a two part system. The tablets do not work on their own and must be activated by an oxidizer. 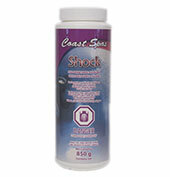 We recommend Coast Spas Shock or Aqua Brite Plus to activate the sanitizer. The amount of shock required is relevant to the amount of existing bromine in the water and the frequency of use of the hot tub. A spa should be maintained at a bromine level of 3-5ppm. Water balance has four factors: pH, Total Alkalinity, Calcium Hardness, and Total Dissolved Solids (TDS). Water balance affects the safety of your equipment as well as the appearance of the water. pH is the most critical, but the Total Alkalinity and Calcium Hardness levels must also be considered. 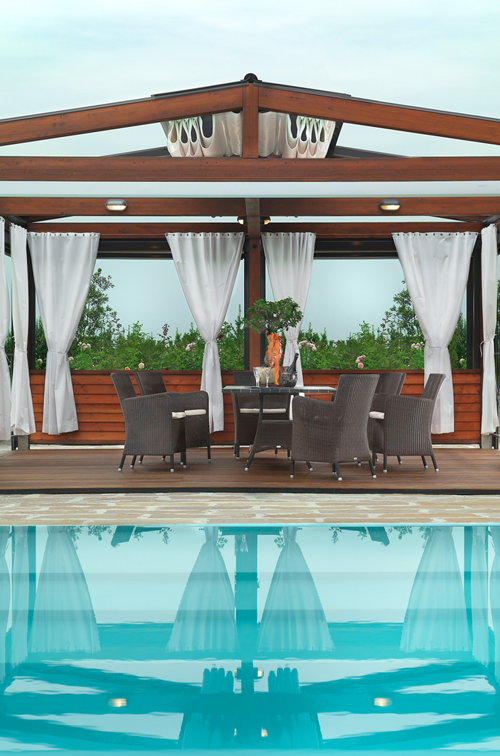 The TDS level of your spa must remain below 1500ppm to easily maintain your water balance. Visit Coast Spas Lifestyles waterlab to test your TDS level for free. pH is the level of acid or base in the water. pH levels should be monitored frequently. When pH is low it will affect bather comfort. High pH levels will render sanitizers ineffective and will cause scaling on the equipment. Maintain pH between 7.2 and 7.8. Once alkalinity level is balanced, if your pH still tets low, pre-dissolve 1 TBSP of Coast Spas pH Up and add to hot tub water. Retest water in 1 hour. If necessary add 1/2 TBSP doses of pH Up until testing indicates that an ideal level has been reached. Once alkalinity level is balanced and only if your pH level is high, pre-dissolve 1 TBSP of Coast Spas pH Down and add to hot tub water. Retest water in 1 hour. If necessary add 1/2 TBSP doses of pH Down until an ideal level has been reached. A balanced alkalinity level is necessary to stop pH levels from fluctuating. If your alkalinity level is low, damage to your hot tub components may occur. A low alkalinity level can also alter the effectiveness of Bromine or Chlorine. The alkalinity level must be balanced before adjusting pH. Pre-dissolve 3-5 TBSP of Coast Spas Alkalinity Booster and retest water in one hour. Add no more than 5 TBSP at one time. 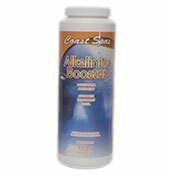 On a fresh fill you may need as many as 15-20 TBSP of Alkalinity Booster to reach a balance level. An in store water test is recommended. Pre-dissolve 1 TBSP of Coast Spas pH Down and add to hot tub water. Retest water in one hour. Adjust if necessary. Calcium hardness is the measure of calcium in the water. Low calcium levels can lead to corrosion of hot tub components. It is important to have your calcium levels tested on a regular basis. It is necessary to pre-dissolve calcium booster prior to adding it to the hot tub water. Calcium Booster is easiest to dissolve using cold water. Calcium that is not pre-dissolved can cause scaling and cloudy water. 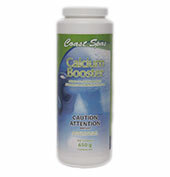 Pre-dissolve 5 TBSP of Coast Spas Calcium Booster in cold water and add to hot tub. Retest in 24 hours. Up to 20 TBSP of Calcium Booster may be necessary to reach ideal levels. However, before adding calcium to your hot tub have your hot tub water tested by your water care specialist at Coast Spas Lifestyles. Drain some of the water from your hot tub to quickly dilute a high calcium level. If your Chlorine reading is above 3.0 or your Bromine reading is above 6.0, you may obtain a false result when testing your pH and alkalinity levels. If this is the case, lower Chlorine or Bromine levels. To lower the levels, remove your dispenser and run your jets for 1 hour cycles with the cover off of your hot tub until you reach an ideal Chlorine or Bromine level. Your Chlorine or Bromine level should be at the ideal level before you perform any other tests. Follow instructions for high Chlorine or Bromine as above. Pre-dissolve and add 2 TBSP pH down. Retest in 1 hour. Do not adjust Chlorine or Bromine level. Do not adjust pH level. Ideal only if you have an ozonator in your hot tub. If not add 1 TBSP of shock per 1000L of water. Do not adjust pH level. Check dispenser for tablets and add 1 TBSP of shock per 1000L of water. Do not adjust pH level. Add 2 TBSP of Coast Clear per 1000L of water to your hot tub once a week. Add 2 TBSP of Coast Stain & Scale per 1000L of water to your hot tub once a week. Defoamer is an effective and safe way to immediately eliminate excess foam in your water. Defoamer should only be used as a 'quick fix' and will not prevent the reoccurrence of foam. Foam is usually a result of improper water balance or foreign contaminents in your water, such as detergents and soaps. Bring your water to your water care specialist at Coast Spas Lifestyles to be analyzed. Dilute Defoamer: one part Coast Spas Defoamer to one part water. Transfer into a spray bottle and spray directly onto foam. CAUTION: More is not better! Minimum amounts of Defoamer will do the job. Excessive use will cause cloudiness and an oily film in your hot tub water. Dilute 1 Cup of Filter Free into 19L of water. Soak the filter in this solution for 8-12 hours. Rinse the filter thoroughly. 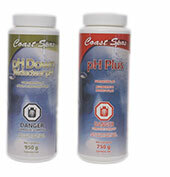 Filter soaking canisters are available at Coast Spas Lifestyles. CAUTION: Do not leave the filter in the solution for more than 12 hours. This will cause premature aging of the filter. Filter Free can cause extreme foaming in your hot tub if the filter is not rinsed thoroughly prior to use. Suspended particulate matter can cause cloudy water. To keep the water sparkling clear, treat weekly with Coast Spas Clear with the system running. Build-Up of organic contaminants Check Bromine or Chlorine level and adjust accordingly. Total Alkalinity or pH too high: Check pH and Alkalinity levels and adjust if necessary. Hardness to high: Add fresh water to your hot tub and add Coast Spas Stain & Scale. High TDS: Empty your hot tub and refill (have TDS tested at Coast Spas Lifestyles waterlab). 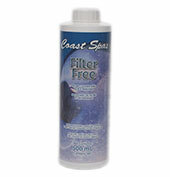 Poor filtration: Clean filter cartridge with Coast Spas Filter Free. Foaming is caused by shampoo and soap residues, hair sprays, cleansers and even "soft" water (low total alkalinity and calcium hardness). 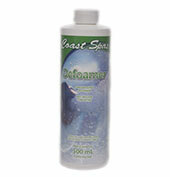 If foaming occurs, treat by squirting Coast Spas Defoamer over the surface of the water. If the water takes on a green or brown tint, it is probably due to metal (copper or iron) in the water. 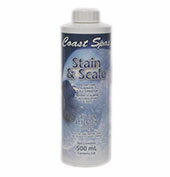 To remove colour and prevent staining , treat with recommended dose of Coast Stain & Scale. If white, chalky or hard residue forms on the sides of the spa , it is due to calcium carbonate scale formation. 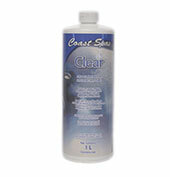 Also treat with Coast Spas Stain & Scale and check your water balance. Other Possible Causes: pH too high Check that your floating dispenser has Bromine or Chlorine pucks and add shock to your hot tub water. Depending on usage, your spa should be drained approximately every 3 months and the filter should be cleaned once a month. Other Possible Causes: Pump not operating properly Have a Coast Spas service technician examine the system. Other Possible Causes: Skimmer basket clogged Remove hair and other debris from skimmer basket on a regular basis.